I watched my pregnant friend's husband rub her shoulders last Friday night. It was tender but nonchalant...perfectly normal. I saw an elderly man cradle the hand of his wife on his way into church. 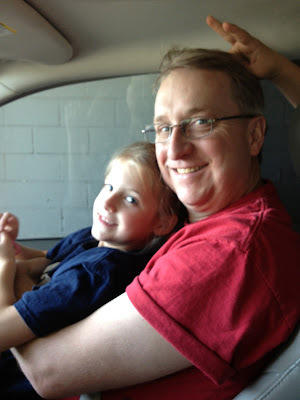 I watched a father with a brutal work schedule smile happily as he had the rare joy of dropping his daughter off at school. My own dear husband texted me a note of support as I went off to San Francisco at dinner time headed to a meeting about saving ice-skating in Yosemite. It would be hours away...through the rigamarole of homework and bedtime and little kids. He went with it. No wishing it weren't so. I'd like to give a shout out to sweet husbands. They are often ignored, taken for granted and relegated to the status of ho hum. Sit-coms like to make them look dumb. Women's magazines like to make them seem extinct. Plenty of commercials sell them as nerdy or inept. They are hard working, tireless, considerate and most of all, there. Day in -- day out -- they show up. They are the ones with the baby in the front pack at the grocery store muddling their way through. They are the ones who clean up the dishes, fold the laundry, hug the momma who just found lice in their daughter's hair, again, and clean up the puke. They hold their wife's hand as they deal with a cancer diagnosis, a job loss or a phone call that makes a nightmare real. They work hard and worry. They are the backbone of so many families -- unnoticed and unappreciated. Today, I am grateful for my gentle, fun-loving, encouraging husband. He helps me to reach for my dreams. He tolerates my sassy weirdness and best of all, he likes it. twenty three to be exact -- but who's counting? I don't know how to explain the supreme comfort in being loved that way but I hope for it, and pray for it, for my own children. Lord, please help the person they love to be generous, kind, warm-hearted and loving. Help them to be accepting and forgiving. Help them to find the good and hold their tongues with the criticism. Help them to be honest and fun. Help them to find real love, enduring love, hopeful love. Thank you to the husbands who love their wives and cherish their families. Thank you to the husbands who man up and do the dirty work...whatever that may be. Thank you to the husbands who work and work and work and then come home to work some more. Thank you to the husbands who don't hold back...who encourage and laugh and dance and cheer. It's 3/21...do you know what that means? It's World Down Syndrome Day!!! Turn on the music, dance and show a little enthusiasm. Three copies on the 21st chromosome and look what happens. You got living out loud. If only the world would stop and notice. This post is for people holding tiny babies, staring at a karyotype and wondering how on earth their child, their family, their world will ever be normal again. Oh friend, your world will most definitely not be what the doom-sayers tell you. It most definitely will not be tragic. And it surely won't be boring. People with Down Syndrome LOVE to be part of the mix. That's why the idea of excluding and isolating these people makes my heart break. They know how to party. They know how to celebrate -- big time. 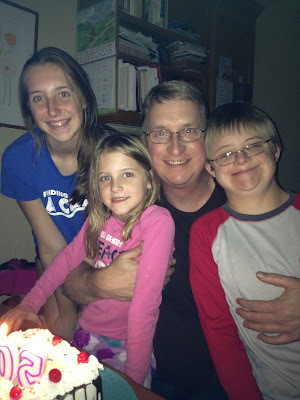 No one likes a birthday, a wedding, a graduation or a sporting event (with someone he loves playing) more than Patrick. In our house, it's Broadway musicals. But for others I know, their child loves baseball or pop music or skiing. The universal truths about life are right here for all to see. Open your heart to new ideas. We all want the same things: love, friendship, connection. love in the same language. So...today, celebrate those people with an extra chromosome. If you don't know anybody...sorry to say, you are missing out. Maybe you want to check out the Special Olympics and offer to volunteer. Or look into your local city's services. There's a whole world of great people out there just dying to meet you. If you do know somebody...give them a high five. Better yet, turn on some music and dance. They are worth knowing and most definitely worth celebrating. Patrick, you make me laugh. You've made my world wider. You give me strength, hope and so much joy. Here's to you -- and all of your friends with designer genes! "But Laura lay awake a little while, listening to Pa's fiddle softly playing and to the lonely sound of the wind in the Big Woods. She looked at Pa on the bench by the hearth, the firelight gleaming on his brown hair and beard and glistening on the honey-brown fiddle. She looked at Ma, gently rocking and knitting. She was glad that the cozy house, and Pa and Ma and the firelight and the music, were now. They could not be forgotten, she thought, because now is now. It can never be a long time ago." This is now: Patrick playing the bass drum with his school band. Snuggling during a drive-through car wash = now. 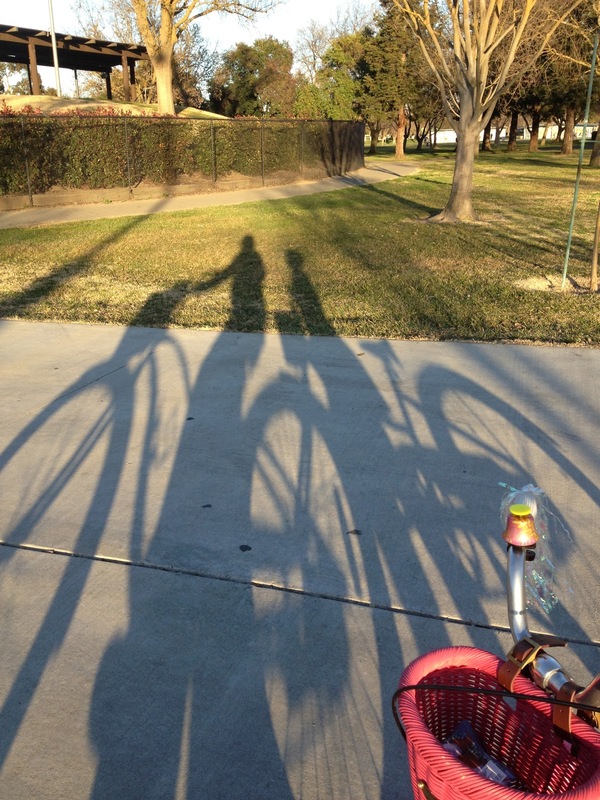 Bike riding on a gorgeous spring day...also now. So many beautiful moments. Breath-taking. Ordinary. Little tiny gifts wrapped in a bow that changes every single day. I try to be just like darling Laura Ingalls Wilder and notice, listen, savor and freeze them. They are passing and fluid. Moving and changing and morphing and growing and adjusting and then in a whisper...gone. When I read those words out loud to Caroline the other night, tears were streaming down my face. Oh to hold that moment of lying in bed next to her, smelling her just clean hair, feeling her body right against mine, listening to the words sprinkle out and create the now. and make a sacred spot for it. I kissed my girl and tucked her in and soaked it all up. How grateful I am for the myriad little pockets of time that make each day a grace-filled gift. How do you savor it? If you tell me your secret, I'll tell you mine. He's a guy with Down Syndrome. Does that diminish his light? Does he deserve an education? Medical treatment? Access to his own money? All of those basic rights are denied people like Patrick everyday. Some people believe he should be separated...in school, in sports, in the world. Because they have lived in our world. They have heard the words. and into their bloodstream of personhood. Words like: retard and idiot. I know you don't want to think it or get all PC, but words hurt. Words that diminish and dismiss make it easier to keep people outside. Words like that make it easier to separate and hate. Words like that make it easier to disregard someone worthy of knowing. Using words like retard perpetuate MISunderstanding and DISability. Stop feeling better about yourself by cutting someone else down. Every single time you use that word -- or stand by while someone else uses that word -- you allow bigotry to continue. You vote with your mouth for separateness and distance...exclusion and excuses. Today I vote for inclusion. Today I vote for flying my freak flag. genuinely acknowledging the priceless gift of every human on the planet. Everyone deserves to be honored for their unique beauty and grace. Today make a choice to change your language. By changing your language, you make the choice to open your mind. You make the choice to open your heart. You make the choice to open your world to more love, more light, and more beauty. People like Patrick will be a little less lonely and isolated. Imagine the day when our children have never heard of such a word. Where we have to explain the bigotry and the separateness that no longer exist. That makes me smile. It's worth the work.